We are all conditioned to think that diamonds are very white in color. In reality, though, with the exception of the very whitest D color diamonds, most have a slight yellow tint. The key is how yellow the tint is, and whether you can see it easily or not. On the GIA color scale, any diamond from D-J is colorless to the naked eye. Beyond this, it becomes easier to see any trace of color. So does that mean you should avoid any diamonds from K color upwards? No, not at all, actually. With care, a diamond with a hint of color can be both great value and beautiful, and L color diamonds are a wonderful example of this fact. Diamond engagement rings normally have one of two metal colors used in the setting – yellow and white. Most people will use a white metal (either platinum or white gold), as this will complement a colorless diamond perfectly. Others use yellow gold, but the effect in either setting is very different depending on the diamond color. Putting a colorless diamond in a yellow gold setting almost defeats the point of paying a high price for the diamond in the first place. The yellow color will be reflected in the diamond, effectively causing the visible color of the diamond to change. Conversely, putting a diamond with a slight tint in a white gold or platinum setting may expose the yellow color. It’s all about contrast, really. The higher the contrast, the more the apparent color of the diamond can change. By the time the scale gets to L color, the yellow in the diamond is becoming more pronounced. It is still faint relatively speaking if you compare it against the color wheel, but it is certainly noticeable to the naked eye. Rather than worrying about how your “white” diamond will be judged, sometimes it’s better to embrace the very fact that it isn’t actually white at all. Put an L color diamond in a white metal setting, and the yellow in the diamond can become quite apparent. In fact, at color L, diamonds are often yellow enough that there’s no “is it, isn’t” debate about the color. We’re not talking bright, fancy yellow, but most people will recognize that it isn’t white. The benefits of a white metal setting are that the L color starts to be a plus, rather than a potential minus. In yellow gold, what was a hint of color suddenly becomes a lot of it. An L color diamond is already warm, by color temperature standards and the yellow gold promotes this warmth even further. The effect of yellow gold on a faint yellow diamond is quite stunning. Such an effect might not be to everyone’s taste, of course. 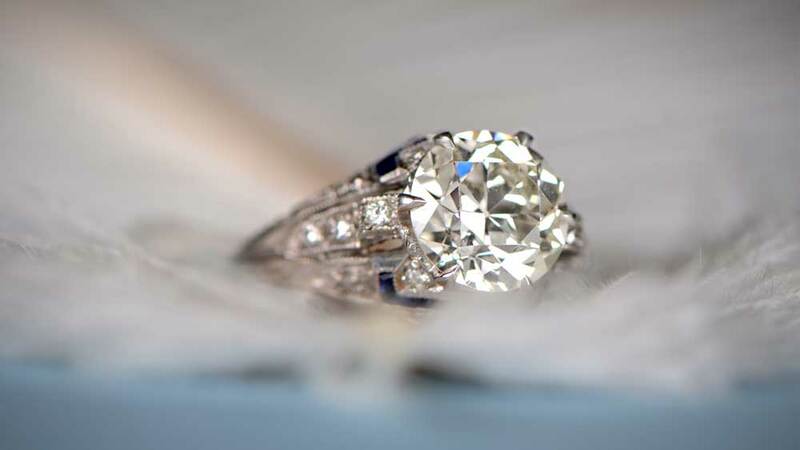 Some would prefer their diamonds to be as white as possible, along very traditional lines. But, if you like the idea of an engagement ring with tons of character that is just that bit different, look at an L color diamond set in yellow gold. If we assume all other parts of the diamond appraisal are equal, a D color will cost a lot more than an L color. Actually, not just a lot more, but a LOT more. In fact, it is not unknown for an L color to cost less than half that of a G or H color. To put that in perspective, you could possibly double the weight of the diamond by choosing an L color over an H color stone. The pricing curve for diamonds doesn’t just climb as it gets towards high-quality D color stones, it becomes almost vertical. Put away any pre-conceptions you may have about an L color diamond, and reap the rewards. Some dealers are reluctant to stock L color diamonds, as they have the misguided impression that nobody wants them. They couldn’t be more wrong. As fancy colors start to see a rise in popularity, so demand for white diamonds with some color rises alongside. Despite this rise, prices for faint color diamonds has a history of reasonable stability. 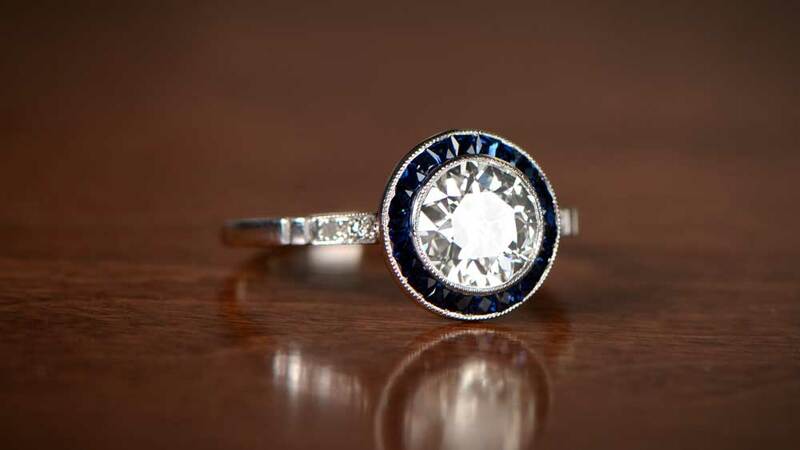 However, if you do think an L color diamond might be the one for you, act fast. Find a dealer who has a range of stones, and see what you like. Fortune really can favor the brave. L-color diamonds that were created before the 1950s may have an added feature – a white face up. A white face-up means that the shades of yellow will only be visible from the sides of the back. Antique l color diamonds with a white face-up could appear to be H-J color. The large culet and small table are usually the contributing elements that help hide the yellow of the diamond. 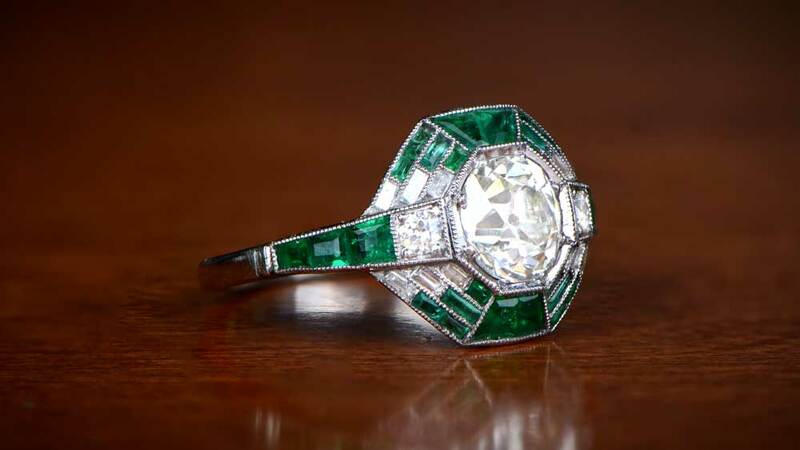 Click here to browse our collection of antique l-color diamond rings.